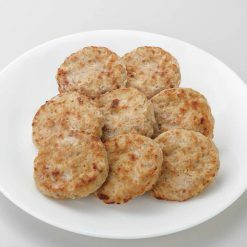 Small hamburger meat from beef, chicken and pork grounds. Perfect portions for lunch boxes or sliders as appetizers. Product contains 240g (30g x 8 pieces). Each piece comes out to portions of 30g, which is a perfect-sized hamburger for your grilled lunch. Also great for children. Ideas for hamburger toppings include bacon, cheese, lettuce, ketchup, onion, tomato, mayonnaise, pickles, fried eggs, avocado, mustard and hot sauce. Examples of burger sides include salad, coleslaw, pickles, potato slices, potato salad and even hot dogs. If you are concerned with the carbs or gluten of bread buns, alternatives to buns include (but are not limited to) grilled eggplant, portobello, sweet potato, sliced zucchini, tomatoes, lettuce, sticky rice, bacon, and more. If you will be using a toaster oven, place a frozen mini hamburger over a sheet of foil or the like for 6-7 minutes. If you prefer microwave, place the frozen mini hamburgers on a heat resistant plate and follow the following heating instructions:For a 500W microwave: place 2 pieces for 1 minute and 20 seconds or four pieces for 2 minutes and 10 seconds. In a 600W model, put 2 pieces for 1 minutes and 10 seconds or four pieces for 2 minutes.The cooking times listed are approximate. Please be sure to make adjustments to the instructions, based on your appliance model, the size of the container, etc. Please be careful not to burn yourself because the heating process will make the product very hot. 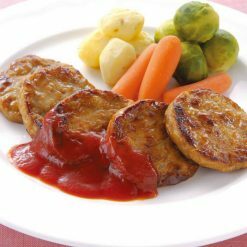 This product contains meat (beef, chicken, pork), onion, breading (bread crumbs, powdered vegetable protein (soy), egg white), whey powder (dairy products), yeast extract, gelatin enzymatic fermented product, salt, tomato ketchup, soy sauce, sugar, pepper. This product is not suitable for anyone with allergies to egg, milk, wheat, beef, soy, chicken, pork or gelatin. Origin of ingredients: beef (New Zealand and Australia). Prepared and packaged in Japan.